In 2008, Celcius Coffee, IdealCup's sister company, completed an audit of waste produced by the business. Not surprisingly, one of the main sources of waste was disposable cups. “We researched reusable cups already in the market and couldn’t find anything suitable,” Celcius owner Steph Fry says. “So we channelled our entrepreneurial spirit and began the process of designing NZ’s first reusable coffee cup - the IdealCup". Proudly 100% designed & manufactured in Aotearoa! 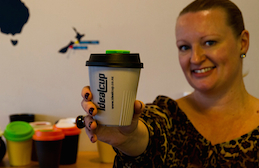 In 2010 the process was complete and IdealCup was born – as a cup and a company. The IdealCup is designed for a lifetime of reuse, after which it can be recycled. Its innovative 'finned' design keeps it warm to the touch, not hot, without relying on imported, non-recyclable silcon bands used in other cups. IdealCup can be manufactured in custom colours and printed with branding. In 2014, IdealCup partnered with Oxfam Trailwalker which had gone ' disposable cup free' for the first time. 90% of teams surveyed at Trailwalker 2014 used reusable cups during the event weekend, resulting in a 37.5% reduction in total landfill waste. Original generation time 3.6557 seconds. Cache Loaded in: 0.0004 seconds.